Variety is reporting that actor Jason Statham (The Bank Job) is in final negotiations to star in the film adaptation of Ken Bruen's thriller Blitz. It isn't clear from the article which character Statham will play, only that the role is that of a tough, uncompromising cop assigned the task of tracking down a serial killer targeting police officers. Paddy Considine (The Bourne Ultimatum) will play his partner. The film will shoot on location in London beginning next month. 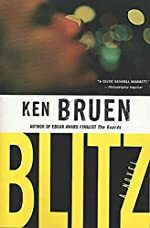 In the book, the fourth in the Detective Sergeant Tom Brant series, DS Brant is in hot water for assaulting a police shrink, Chief Inspector Roberts' wife has died in a horrific car accident, and WPC Falls is still figuring out how to navigate her job as a black female investigator in the notorious unit. When a serial killer takes his show on the road, things get worse for all three. Nicknamed "The Blitz" by the rabid London media, the killer is aiming for tabloid immortality by killing cops in different beats around the city.